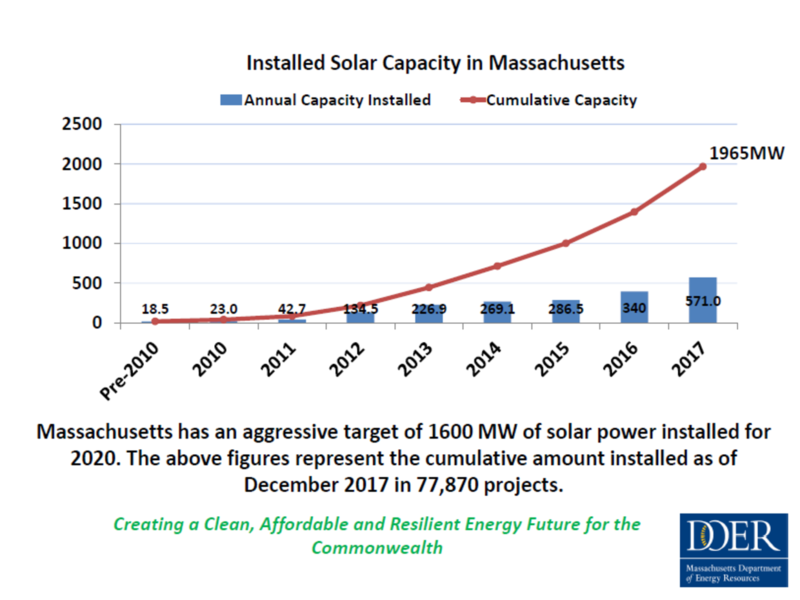 The path to Massachusetts' current solar policies has been many years in the making; the history of solar in Massachusetts goes back more than four decades. Below is brief overview of the history of solar in the Commonwealth. For an in-depth review of how electricity markets work in New England, read this report. In response to the 1970s oil crisis, the Massachusetts Legislature introduced a number of tax incentives to support the development of renewable energy resources, including solar. The 1970s were a tumultuous time for energy in the United States. The Arab oil embargoes impacted every facet of life and the economy. These crises prompted a policy response at the federal and state levels that emphasized domestic energy sources, including renewable energy. In the late 1970s, Massachusetts enacted a suite of tax policies in order to encourage solar and wind energy. These tax policies include: (1) Excise Tax Deduction of 1976 (M.G.L. c. 63, § 38H); (2) Renewable Energy Equipment Sales Tax Exemption of 1977 (M.G.L. c. 64H, § 6(dd)); (3) Residential Renewable Energy Income Tax Credit of 1979 (M.G.L. c. 62, § 6(d)); and (4) Alternative Energy and Energy Conservation Patent Exemption of 1979 (M.G.L. c. 62, § 2(a)(2)(G)). These tax policies remain in place today and are largely unchanged. The Massachusetts Department of Public Utilities laid the foundation for net metering, as it exists today, in the early 1980s after Congress passed the Public Utilities and Regulatory Act. In 1978, Congress passed the Public Utilities Regulatory Policy Act (“PURPA”). PURPA created a set of rules for certain renewable energy facilities (known as Qualifying Facilities or “QFs”), including solar. PURPA was a significant step forward for renewable energy because for the first time, it required electric utilities to (a) interconnect QFs to the grid; (b) buy the electricity they generated; and (c) sell electricity to customers with on-site QFs. Before PURPA, a customer could only install a renewable energy system if it received permission from the electric utility. When the Massachusetts Department of Public Utilities (“DPU”) implemented PURPA, it had to decide the appropriate price electric utilities would pay for the electricity generated by QFs. In PURPA terms, this price is commonly referred to as the “avoided cost.” Avoided cost refers to the price electric utilities would have otherwise incurred to generate the same amount of electricity. The DPU determined, in order D.P.U. 535 issued July 23, 1981, that the avoided cost for QFs 30 kilowatts (“kW”) and smaller, was the retail electricity rate. This determination effectively created net metering in Massachusetts. By determining that the avoided cost was the retail rate, the DPU was allowing a “net” reading of an electricity customer’s consumption meaning, customers could run their meters backwards every time they exported electricity to the grid. For customers with 30 kW systems or smaller — which is most customers in a single family home or small business — the electric utilities only had to read the customer’s meter once per billing period. In its order, the DPU referred to this as the “net energy billing method.” Although the net energy billing method allowed customers to be compensated for any net excess generation (electricity generated on-site above and beyond on-site consumption), this framework did not provide for net excess generation to carry over to subsequent billing periods as it does today. Massachusetts restructured its electric industry in the 1990s, expanding net metering and laying the groundwork for the solar boom to come. In the mid to late 1990s, Massachusetts restructured its electric utility companies in order to create a competitive wholesale electricity market. Restructuring required the electric utility companies to sell all of their generation assets and prohibited them from owning any generation except in very limited circumstances. The end result was that the electric utility companies in Massachusetts no longer generated electricity — they simply delivered electricity to customers and were responsible for maintaining the wires and equipment needed to do so. As such, electric utility companies in Massachusetts are commonly referred to as “distribution companies.” For more information on restructuring, please refer to the DPU. Restructuring also impacted renewable energy because it changed the rules for QFs and created the Renewable Energy Trust Fund. Specifically, the DPU expanded the size of systems eligible for avoided cost compensation at the retail rate, from 30 kW to 60 kW. This change meant that QFs up to and including 60 kW could now net meter. For more information, see order D.P.U./D.T.E. 96‑100 at pages 22-23 and 220 C.M.R. § 8.00 et seq. The Renewable Energy Trust Fund (“Fund”) was created with the specific intent of supporting the growth of renewable energy technology in Massachusetts. The Fund was originally administered by the Renewable Energy Trust, which was part of the Massachusetts Technology Collaborative. Among other programs, the Renewable Energy Trust administered a rebate program for solar. The rebate program provided an incentive to customers in the form of a $/kW payment once a solar facility was built. The rebates that were available to customers were limited by the total amount of money in the Renewable Energy Trust Fund ("Fund"). Money for the Fund was raised through a system benefit charge (“SBC”) paid by electric ratepayers of the distribution companies. An SBC is a small per kilowatt-hour (“kWh”) charge on electricity that is often used to raise funds for energy efficiency and renewable programs. In Massachusetts, the SBC for the Fund is set at $0.0005/kWh. The Fund was transferred to the Massachusetts Clean Energy Center (“MassCEC”) after it was formed in 2009. The monies raised by the SBC are now used to support MassCEC, which is dedicated to accelerating the success of clean energy technologies, companies and projects in the Commonwealth. In April 2007, Governor Patrick announced a goal of 250 megawatts (“MW”) of solar by 2017. At the time of Governor Patrick’s announced goal, there were about 3 MW of solar in Massachusetts. The following year, the Legislature and Governor Patrick worked together on several pieces of landmark environmental legislation, including the Green Communities Act (“GCA”), the Global Warming Solutions Act, and the Green Jobs Act. The solar goal and these laws set the stage for the future of solar policy in the Commonwealth. The programs described below were so successful for developing solar, the 250 MW goal was met four years early. At the time, only 3 MW of solar were installed in Massachusetts. The Green Communities Act significantly expanded net metering and enabled virtual net metering. The GCA, however, limits the amount of solar that is eligible for net metering. These limits, referred to as net metering caps, prevent the development of a long-term, sustainable solar market. Several pieces of legislation have been introduced to address the net metering cap issue but it remains to be seen what action the Legislature will take on net metering in 2015. The Green Communities Act significantly expanded net metering in Massachusetts. Section 79 of the GCA: (1) expanded the eligible system size to 2 MW; (2) allowed net metering credits to carry over from month-to-month; and (3) allowed for the transfer of net metering credits from one customer to another customer. During the implementation of the GCA, the DPU further interpreted the net metering rules. The DPU’s interpretation included (a) allowing for virtual net metering (the ability for a project to be located remotely from the end user, and still offset customers’ bills via net metering credits), (b) requirements for net metering reports by the distribution companies, (c) prohibition of distribution companies from owning renewable energy certificates as a result of net metering, and (d) eligibility of third party ownership (or other ownership models) for the purposes of net metering. Net metering has been — and continues to be — integral to the development of solar in Massachusetts. However, net metering is limited in Massachusetts through net metering caps. The Legislature has acted on three occasions since the passage of the GCA to raise net metering caps and thereby provide an opportunity for new solar projects to be built. But each increase of the net metering caps has been too low to ensure the success of solar in Massachusetts. Several bills have been filed to raise or abolish net metering caps in the current legislative session but its unclear what the Legislature will do on this issue. To learn more about net metering in Massachusetts, please refer to the DPU. At the same time the GCA expanded net metering, it provided an opportunity for the Massachusetts Department of Energy Resources (“DOER”) to use the Renewable Portfolio Standard program to jumpstart the solar market. DOER did just that when it created the solar carve-out programs, which are often referred to as SREC I and SREC II. The Renewable Portfolio Standard (“RPS”) was first created by the Legislature as part of the restructuring of the electricity industry in the late 1990s. Section 32 of the GCA created on option to carve-out a portion of the RPS to further encourage development of on-site (a.k.a. distributed) generation, which lead to creation of the Solar renewable energy certificates (“SRECs”). The first solar carve-out program, SREC I, began in January 2010 and was closed to new solar projects in April of 2014. The second solar carve-out program, SREC II, was finalized in 2014. Among other things, SREC II was designed to help the Commonwealth achieve its 1600 MW solar target. For more information on the SREC programs and/or the Renewable Portfolio standard, please see DOER’s website. Legislation passed in April 2016 directed DOER to develop a successor program to SREC II. DOER has done that and the new program is named SMART. SMART will take effect after the DPU approves the tariff needed to administer the program. Solar rebates once served as the primary state-level policy to encourage homeowners to install solar. As the solar market and policies have evolved, these rebates have declined and given way to the Residential Solar Loan Program. When MassCEC was formed in 2009, as part of the Green Jobs Act, one of its primary responsibilities was to administer the Renewable Energy Trust Fund, which included solar rebate programs. Under MassCEC, the solar rebate programs were called Commonwealth Solar. The available rebates changed over time as the solar market has evolved and prices for solar panels declined. When the SREC program was implemented, the level of the solar rebates was decreased significantly. The CEC currently administers Commonwealth Solar II rebate program. This program closed on January 20, 2015 after committing all of its available funding. The successor program to Commonwealth Solar is the Mass Solar Loan Program. This $30 million program is designed to connect homeowners with low-interest loans to help finance the installation of PV systems. This program aims to increase the adoption of small-scale solar electricity systems through a community outreach and a tiered pricing structure that increases the savings for everyone as more home and business owners in the community sign up. This program is administered through a partnership between MassCEC and DOER. The Solarize Mass model has been so successful that it led to the creation of Mass Solar Connect, which offers competitive solar pricing to members of Massachusetts-based non-profits. In a limited departure from electric industry restructuring, distribution companies are allowed to own and operate solar energy facilities. Section 58 of the Green Communities Act allows distribution companies to construct, own, and operate solar energy facilities. Prior to this provision — pursuant to the restructuring of the electricity sector — distribution companies were not allowed to own generation. The current version of this provision, M.G.L. Chapter 164 § 1A(f), has a sunset date of December 31, 2017 for the construction of the utility-owned solar facilities. The solar market and policies in Massachusetts are constantly evolving. Whether solar is here to stay and Massachusetts will remain a leader on solar in the coming years, remains to be seen. If the Legislature and the Governor fail to chart a path that will keep solar working for Massachusetts and our solar-powered economy growing, we will lose all we've gained in recent years. Learn more at our Solar Policy and Legislation page.